This is a time of many transitions. It was just over a month ago that I joined FHWA's Office of Safety, but in that month we have had a national election, seen significant changes in our economy, and continued to experience fewer people traveling in their cars (the latter leading to a commensurate decrease in the size of the Highway Trust Fund). Our safety numbers are also changing. The decrease in fatalities on our roadways last year is encouraging, and thanks to all of our partners in highway safety for their contribution to this accomplishment. I believe your efforts to take a more data-driven, systematic approach to safety is helping make this difference. But just as we have seen staggering fluctuations in the economy and the price of gasoline, we must recognize that many of the factors that affect safety on our roads can also change. Although it is always encouraging to see progress, we should not take that change for granted. We still have far too many deaths and serious injuries on our roadways, and we need to continually remind ourselves of how much more needs to be done. We can make our roads safer. And safe roads save lives. Over the years, The Safety Compass has served as an important tool in our continuing efforts to provide decision-makers important information, tools and resources to achieve their highway safety goals. In this issue, we have included an article on a recent initiative we are taking with our FHWA Division offices to advance the implementation of nine safety countermeasures that we believe have shown great potential to reduce highway fatalities and injuries. Our hope is that State and local officials will see these technologies and practices as tools that can be used to address the challenges that they have identified in their strategic highway safety planning process. Those plans have formed a powerful foundation for safety improvements in many parts of the country, and we are seeing wonderful examples of where the partnerships that were formed to develop the plans are also the partnerships making those plans a reality. As one of those partners, we plan to continue to provide you with tools, ideas and best practices to make that happen. I look forward to our work together and our continued progress in improving highway safety. Keeping citizens safe on the highways is a top priority for the Washington State Department of Transportation (WSDOT). Over the past decade, there has been a downward trend in traffic fatalities on Washington State’s highways, streets, county roads, and other public roadways. This trend continued in 2007 with a 10.6% decrease from 2006. These reductions are due in part to new State laws, including the seat belt law, tougher impaired driving laws, increased enforcement (including speed and DUI patrols), and significant investments in highway safety projects. These projects include cable median barriers, rumble strips, and intersection modifications. In 2006, there were 65 fatal collisions on State highways where “over centerline” was identified as a contributing circumstance. To reduce these collisions, WSDOT has installed, or will install, centerline rumble strips on roughly 960 miles of Washington highways. Rumble strips are grooves or rows of raised pavement markers placed perpendicular to the direction of travel to alert inattentive drivers. As a vehicle passes over the rumble strips, they produce noise and vibration, alerting the driver that they are drifting from their lane. Of the highway miles with centerline rumble strips, WSDOT engineers have conducted preliminary evaluations of 518 miles that have been in place six months or longer. 50% reduction in fatal and serious injuries resulting from crosscenterline collisions. It is important to note that these reductions may not be entirely attributable to rumble strips, as other safety improvements may have been implemented under the same contract that installed the rumble strips. Previous analyses of rumble strips have focused on cross-centerline collisions. As a next step, WSDOT will analyze all collision types - not just over-centerline - before and after the installation of centerline rumble strips. Although reducing overcenterline collisions is the expected benefit from centerline rumble strips, there may be other collision types affected by rumble strips. This study will evaluate centerline rumble strips, shoulder rumble strips and the combination of centerline and shoulder rumble strips. It will also identify the contributing factors and site conditions where rumble strips are the most and least effective. The study is expected to be available in six to nine months. The study’s outcomes will guide future locations that would benefit from rumble strip installation. Cable median barriers are installed to reduce the risk of vehicles leaving the roadway and striking hard objects, steep slopes, or crossing into oncoming traffic. While it is not possible to prevent all crossover collisions or vehicles leaving the road, cable barriers on the roadside or in the median help reduce the risk of very severe collisions. A 62% reduction of serious injury and fatal collisions (24.8/year to 9.5/year after installation). Annual cross median collisions decreased 73%. These reductions are significant: traffic volume grew 13% for the 177 miles of highway where WSDOT installed cable median barriers during this same time. Collisions in the median routinely increase after any type of median barrier system is installed. An errant vehicle that may have been able to travel 30 or 40 feet into an open median before installation may only be able to travel 15 to 20 feet before it strikes a newly placed barrier. This creates a dilemma for WSDOT engineers in determining how to balance the benefits and risks of barriers. Median barriers reduce the risk of serious crossover collisions but also create some risks for drivers who run off the road, as the barriers are more likely to be struck, since cable barriers tend to capture vehicles. Cable barriers offer two advantages over concrete or beam guardrail barriers: vehicles have a lower likelihood of rebounding back into traffic, and injuries are usually less severe. Concrete barriers reduce cross-median collisions more effectively than cable, but result in more frequent injuries. Cable barriers are also effective in reducing rollover collisions in the median. Although cable barriers may not contain a vehicle that is already rolling, those highways with barriers experienced a 37% reduction in annual median rollover collisions. These collisions often result in severe injuries, as occupants are subject to a wider range of forces and impacts with their vehicle’s components. Note: This article is extracted from the Gray Notebook, WSDOT’s quarterly performance report on transportation systems, programs and department management. WSDOT provides an annual update on highway safety. This article, and other articles on highway safety, can be found at http://www.wsdot.wa.gov/Accountability/. Of the more than 41,000 people killed on our Nation’s highways annually, over 25,000 - nearly 60 percent - of fatalities occur when vehicles unsafely depart a lane and/or roadway, with most of these single vehicle crashes. In some cases, the vehicle crossed the centerline and was involved in a head-on crash or opposite direction sideswipe. In others, the vehicle left the roadway to roll over or impact one or more natural or man-made objects, such as trees, utility poles, bridge walls, embankments, or guardrails. As part of American Association of State Highway and Transportation Officials’ (AASHTO) goal to aggressively reduce highway fatalities, their recent report “Driving Down Lane-Departure Crashes: A National Priority” emphasizes roadway departure solutions and supports FHWA’s Roadway Departure program. Pete Rahn writes in the preface to the report, “As you turn the pages of Driving Down Lane-Departure Crashes – a National Priority, think of this: By the time you have finished reading this report; one more person will have died as a result of a run-off-the road crash. Every 21 minutes a highway death occurs from lane departure. All of us within a State Department of Transportation have a responsibility for improving the safety of people on our roads, but some States have emerged, through top level leadership, as true champions. As shown throughout this report, they have implemented systematic, low-cost improvements that have resulted in dramatic reductions in crashes and fatalities. Often transportation officials act to improve a high-incident location, when there may be another identical situation elsewhere on the system. The AASHTO report stresses that a key to reducing crashes is use of a systematic approach and recommends eight specific ways to make positive safety improvements. The improvements described in this report are most effective when they are applied throughout the highway system, as a means to keep future crashes from occurring. The report also includes examples of successfully State- implemented strategies that can be used to keep vehicles safely on the road, or protected if they leave the roadway, and which have resulted in significant reductions in crashes and fatalities. Ensure that your Strategic Highway Safety Plan (SHSP) is a living document. Develop action strategies to implement your SHSP and provide appropriate resources for safety, including staff, dollars, and policies. Assign a multidisciplinary champion for safety. Conduct weekly/monthly safety program meetings with safety staff/team. Share safety expectations with key management staff. Establish safety as a leadership performance measure. Provide safety program assistance to local governments. Fully utilize all funding resources available for safety. Requiring a minimum four-foot paved shoulder on major roads. Providing edge line and centerline rumble stripes for all major roads, as well as for minor roads with a history of crashes. Using six-inch stripes for all edge line and multi-lane skips on all major roads. Using curve speed plaques for every curve/turn sign to indicate appropriate speeds. Providing guardrail and median guard cable delineation on major roads. Installing emergency reference markers every 0.2 miles on Interstates. Upgrading signs for better visibility. Highway Safety and Trees: The Delicate Balance (DVD and brochure): Addresses the hazards of trees adjacent to roadways and design solutions that objectively consider safety with other community concerns. (DVD # FHWA-SA-06-13. Brochure # FHWA-SA-06-12.) Brochure online at http://safety.fhwa.dot.gov/roadway_dept/clear_zones/fhwasa0612/. For more information about the FHWA Roadway Departure Program, contact Mary McDonough, FHWA Office of Safety Roadway Departure Team Leader at (202) 366-2175 or mary.mcdonough@dot.gov. 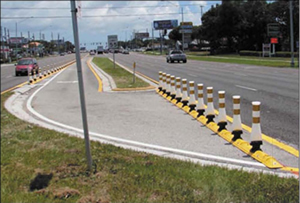 The Florida Department of Transportation’s District 7 Traffic Operations Safety Office developed a rapid deployment safety program utilizing the Qwick Kurb® median separator system. The system’s ease of installation allows for fast deployment at high crash locations where it is determined immediate action will greatly reduce accidents in places such as work zones, problematic intersections and merge areas. Florida has used Qwick Kurb® to quickly redirect traffic or close full median openings in lieu of conventional roadway construction solutions that are more costly and time-consuming. From March to September 2007, the system was implemented at 16 full median opening project locations. Its cost effectiveness and construction time savings have been remarkable. For an estimated cost of $15,000 per location, it has been calculated that the installation has resulted in eight crash reductions per year per location, with an associated net construction cost savings of approximately $125,000 per location. Using this system has reduced the construction time to address safety issues from a typical 30-month process to just two weeks! 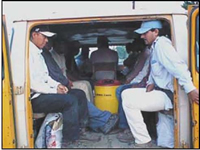 The Safety and Farm Labor Vehicle Education (SAFE) Program was created in 1999 to address the transportation of thousands of farm workers who are hired for field labor within the boundaries of the California Highway Patrol’s (CHP) Central Division. Prior to the implementation of this program, an alarming number of accidents occurred in which innocent farm workers lost their lives due to the poor conditions of the vehicles in which they were transported. The objectives of the SAFE program are to provide education and enforcement in an effort to reduce farm labor vehicle (FLV) collisions and fatalities due to unsafe vehicles. Since the inception of the program, the CHP has established a positive working relationship with farm workers, labor contractors, and the farming community. SAFE has successfully utilized bilingual officers to reach out to a community which traditionally has been reluctant to interact with law enforcement. Other resources used to accomplish this objective include a toll-free number to report violators and electronic and print media. In addition, SAFE officers appear regularly on both English and Spanish television and radio programs to inform audiences of FLV inspection operations and offer important traffic safety tips for FLV’s and farm worker transportation. The success has led to the expansion of the SAFE program to other CHP Field Divisions. The program has also gained nationwide notoriety by prompting new Federal regulations introduced in 2006 that relate to the safety of field workers. Between March 2005 and July 2006, 15 teenagers died in traffic crashes on Tazewell County, Illinois roadways. This was a marked and disturbing increase over what is typically an average of one to two fatalities annually. The Illinois State Police District 8, along with the Illinois Department of Transportation (IDOT), the Tazewell County Sheriff, and the Tazewell County Coroner convened numerous local and State authorities and stakeholders to discuss this situation and determine how to make immediate and longterm improvements to address this problem. The outcome of the combined effort was the Tazewell County Teen Initiative, a creative and ambitious initiative that sparked a multifaceted public awareness campaign targeted at schools, hospitals, emergency response teams, media and the private sector. The initiative included special enforcement campaigns staffed by officers from every police agency in Tazewell County; educational programs developed by students, teachers and school administrators; $1.2 million in road upgrades facilitated by IDOT and the Tazewell County Traffic Engineering Department; and educational programs and equipment donated by corporations such as Ford Motor Company Foundation, Caterpillar Tractor Company, and State Farm Insurance. Since the program’s launch, there have been no teenage traffic fatalities in Tazewell County. This is truly a safety success. The Road Safety Audit (RSA) is a frequently-used method whereby independent qualified teams examine the safety performance and crash potential of existing and planned roads and traffic projects. The Road Weather Safety Audit (RWSA) is a logical extension of conventional RSAs, with particular emphasis on highway safety from an adverse weather impact perspective. Most RSAs are performed under favorable weather conditions. Consequently, the impact of traffic operations and safety during adverse weather conditions such as snow, rain, sleet, and fog are often not considered. 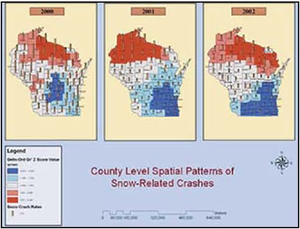 A study by the University of Wisconsin-Madison resulted in the institutionalization of the RWSA into WisDOT’s policy, heightening awareness of weather issues that impact infrastructure and operations. The project had several objectives, including development of a comprehensive and formalized RWSA for Wisconsin; defining and identifying key processes and procedures for RSAs and RWSAs under WisDOT’s organizational structure; providing a framework to implement audit procedures through checklists covering all stages of a road project; integrating the RSA/RWSA with current policies by incorporating it into the WisDOT Facilities Development Manual; and identifying and providing sources and procedures for basic information regarding the preparation of data for different stages of the audit process. Mark your calendars and begin preparing to submit your application for the 2009 National Roadway Safety Awards. The call for nominations will officially begin in January 2009 with a June 1, 2009 deadline for submissions. As indicated in an action memo to FHWA field offices on the implementation of proven safety countermeasures, the Office of Safety strongly encourages widespread use of the following countermeasures to accelerate achieving local, State, and national safety goals. Road Safety Audits. A road safety audit (RSA) is a formal safety performance examination of an existing or future road or intersection by an independent and multi-disciplinary team. It reports on potential road safety issues and identifies opportunities for improvements in safety for all road users. Rumble Strips and Rumble Stripes. Rumble strips are raised or grooved patterns on the roadway that provide both an audible warning (rumbling sound) and a physical vibration to alert drivers that they are leaving the driving lane. They may be installed on the roadway shoulder or on the enterline of undivided highways. If the placement of rumble strips coincides with centerline or edgeline striping, the devices are referred to as rumble stripes. Median Barriers. Median barriers are longitudinal barriers used to separate opposing traffic on a divided highway. They are designed to redirect vehicles striking either side of the barrier. Median barriers can significantly reduce the occurrence of cross-median crashes and the overall severity of median-related crashes. Safety Edge. The Safety Edge is a specific asphalt paving technique where the interface between the roadway and graded shoulder is paved at an optimal angle to minimize vertical drop-off and provide a safer roadway edge. A Safety Edge shape can be readily attained by fitting resurfacing equipment with a device that extrudes and compacts the shape of the pavement edge as the paver passes. This mitigates shoulder pavement edge drop-offs immediately during the construction process and over the life of the pavement. This technique is not an extra procedure but merely a slight change in the paving equipment that has a minimal impact on the project cost. In addition, the Safety Edge improves the compaction of the pavement near the edge. Shoulders should still be pulled up flush with the pavement. Roundabouts. The modern roundabout is a type of circular intersection defi ned by the basic operational principle of entering traffic yielding to vehicles on the circulatory roadway and certain key design principles to achieve deflection of entering traffic by channelization at the entrance and deflection around a center island. Modern roundabouts have geometric features providing a reduced speed environment that offers substantial safety advantages and excellent operational performance. Left and Right Turn Lanes at Stop-Controlled Intersections. Left-turn lanes are auxiliary lanes for storage or speed change of left-turning vehicles. Installation of left-turn lanes reduces crash potential and motorist inconvenience, and improves operational efficiency. Right-turn lanes provide a separation between rightturning traffic and adjacent through traffic at intersection approaches, reducing conflicts and improving intersection safety. Yellow Change Intervals. The yellow change interval is the interval following a green signal indication during which the yellow signal indication is displayed to warn drivers of the impending change in right-of-way assignment. Yellow change intervals that are not consistent with normal operating speeds create a dilemma zone in which drivers can neither stop safely nor reach the intersection before the signal turns red. Medians and Pedestrian Refuge Areas in Urban and Suburban Areas. The Median is the area between opposing lanes of traffic, excluding turn lanes. Medians can either be open (pavement markings only) or they can be channelized (raised medians or islands) to separate various road users. Pedestrian Refuge Areas (or crossing islands)—also known as center islands, refuge islands, pedestrian islands, or median slow points—are raised islands placed in the street at intersection or midblock locations to separate crossing pedestrians from motor vehicles. For more information on these countermeasures, visit http://safety.fhwa.dot.gov. Washington, D.C. – American motorists blame other motorists for unsafe driving, despite the fact that many admit to doing the same dangerous practices themselves, according to a new report by the AAA Foundation for Traffic Safety. For example, Americans rated drinking drivers as the most serious traffic safety issue, yet in the previous month alone, almost 10 percent of motorists admitted to driving when they thought their blood alcohol content was above the legal limit. Three out of four of motorists believed that they are more careful than others behind the wheel. Eighty-two percent of motorists rated distracted driving as a serious problem, yet over half of those same individuals admitted to talking on the cell phone while driving in the past month, and 14 percent even admitted to reading or sending text messages while driving. Over seven out of ten motorists rated red light running as a serious problem, yet over half of those same individuals admitted to speeding up to get through yellow lights, and five percent even admitted to having run a red light on purpose in the past month. Nearly three out of every four motorists rated speeding as a serious problem, yet 40 percent of those same individuals admitted to driving 15 mph or more over speed limit on the highway in the past month, and 14 percent even admitted to having driven 15 mph or more over the limit on a neighborhood street. “All of us should work to build a better traffic safety culture, where more than 40,000 deaths annually is NOT considered acceptable, where in conjunction with tougher laws, safer cars and better engineering, individuals take responsibility for their own driving instead of blaming the other guy,” said Kissinger. 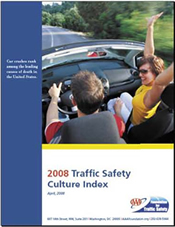 The full report “2008 Traffic Safety Culture Index” is available online at http://www.aaafoundation.org. For more information contact Fairley Mahlum, AAA Foundation for Traffic Safety, at (202) 638-5944 ext 4, or fmahlum@aaafoundation.org. Americans rated drinking drivers as the most serious traffic safety issue, yet in the previous month alone, almost 10 percent of motorists admitted to driving when they thought their blood alcohol content was above the legal limit. The Federal Highway Administration, with support from the Transportation Safety Planning Working Group (TSPWG), has released a new book featuring noteworthy practices of stakeholders at all levels of transportation safety. Making the Case for Transportation Safety – Ideas for Decision Makers features 20 examples of noteworthy practices successfully implemented by executives, managers, stakeholders, and practitioners working to improve safety on the Nation’s roadways. Contact information for the implementing agency or organization. The book also includes a section on the importance of integrating safety into the transportation planning process and resources that provide data and support for safety practitioners. 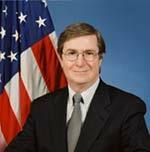 To access Making the Case for Transportation Safety – Ideas for Decision Makers, visit: http://tsp.trb.org/research.asp. In 2002, South Carolina had the third highest death rate by vehicle miles traveled (VMT) in the Nation, with 2.23 deaths per 100 million VMT, a rate 48 percent higher than the national average of 1.5. Most of the safety problems were occurring on rural secondary roads, which had a fatality rate over three times higher than Interstate highways (3.42 versus 0.92). The South Carolina Department of Transportation (SCDOT) is responsible for over 65 percent of the State’s roadway system, including the majority of secondary roads. Most of the secondary roads are not eligible for Federal-aid funding, and SCDOT previously had dedicated few resources to address problems on those roads. In 2003, SCDOT initiated the Crash Reduction by Improving Safety on Secondaries (CRISOS) program, which used crash and fatality rates to identify high-risk rural secondary roads. These roadways were also screened for crash patterns that could be mitigated with engineering solutions. Once a list of CRISOS roadways was developed, SCDOT coordinated an initial site visit to determine whether low-cost strategies would be applicable. For eligible locations, a multidisciplinary Road Safety Audit (RSA) team conducted a full field review and made project recommendations. SCDOT allocated $16 million per year over five years for low cost improvements on CRISOS roads. Funding for the CRISOS program was initially made possible due to an innovative TEO-45 indirect cost soft match program approved by FHWA. This allowed the SCDOT to recover eligible administrative costs that would not otherwise be claimed on Federal-aid projects. This savings provided the fl exibility for the SCDOT to advance the CRISOS program as a State funded activity. Some improvements implemented on CRISOS roads since 2004 include extra large stop signs, guardrail installation, vegetation removal, rumble strips, retroreflective sheeting on sign channel posts, and chevron signs on curves. To complement the infrastructure improvements, SCDOT worked with emergency medical services (EMS), public information and education specialists to incorporate information on roadway departure crashes and safe driving strategies into their ongoing outreach activities. SCDOT worked with local and State law enforcement agencies to conduct targeted enforcement on CRISOS roads, and officers added information on rural secondary road safety to their public outreach efforts. SCDOT’s Safety and Communications Offices also secured significant print and electronic media coverage of the issue. Making our roads safer through a data-driven, systematic approach and addressing all “4Es” of safety: engineering, education, enforcement, and emergency medical services. Increasing awareness of the need for roadway safety infrastructure improvements is very important. Safety should be considered first, every time and at every stage of a project. Fatalities on CRISOS roads declined from an average of 71 deaths per year between 1998 and 2002 to an average of 62 deaths from 2006 to 2007, a 13-percent reduction. An average of 1,752 injuries occurred on CRISOS roads from 2006 to 2007, which is a reduction of 116 (6 percent) compared to the annual average of 1,868 injuries between 1998 and 2002. Developed CRISOS, a targeted hazardous location program that decreased traffic related fatalities and serious injuries. Expanded the CRISOS program to all rural roads and included low cost, short-term safety improvements in the State’s Strategic Highway Safety Plan. Implemented a multidisciplinary approach to traffic safety, including engineering improvements, increased enforcement and education, and support from the emergency medical services community. As Federal and State funds for building roads decrease and a greater proportion of funding is used for maintenance activities, State DOTs must develop creative, cost-effective solutions to extend the useful life and performance of critical facilities. Faced with the reality that jurisdictions cannot simply build their way out of congestion problems, plus the growing need for focused countermeasures to reduce fatalities and injuries, Virginia planners and safety engineers have jointly developed a plan to address such problems. The Strategically Targeted Affordable Roadways Solutions (STARS) program involves State and local transportation planners, traffic engineers, safety engineers and operations staff in identifying “hot spots” along Virginia roadways where safety and congestion problems overlap, and where shortterm operational improvements are feasible. At the core of this new program is an innovative, GIS-based methodology that analyzes and assists with the identification and prioritization of the critical safety and congestion locations in each of Virginia’s five Systems Operations Regions. Each region has established a multi-disciplinary team to oversee program implementation. Each team’s focus is to identify and prioritize specific highway locations and then determine feasible lowcost, high-benefit improvements that target safety and congestion problems. Turn lanes – construction or extension. Final recommendations from STARS will be incorporated into Virginia’s 2035 State Highway Plan, which will be finalized late 2009. Funding to implement STARS project recommendations may come from the Highway Safety Improvement Program, designated funds, and/or coordinated with planned maintenance improvements. The STARS program is truly a collaborative effort within VDOT, the MPOs, the Governor’s Highway Safety Office, and local government safety officials. A presentation on STARS was made at the 2008 Traffic Records Forum in July. For more information, please contact Robin Grier, Assistant Division Administrator for Transportation and Mobility Planning for VDOT, at robin.grier@vdot.virginia.gov. What exactly is a roundabout, and how are today’s roundabouts different from the traditional traffic rotaries that have been in use for decades? A modern roundabout is a type of circular intersection, engineered for safety by incorporating islands on the approaches, yield control of entering traffic, and appropriate roadway curvature to reduce vehicle speeds. Today’s roundabouts are typically smaller than the large, high-speed rotaries still in use in some parts of the country, yet they are larger than neighborhood traffic circles used to calm traffic. Compared to other types of intersections, roundabouts have demonstrated safety and operational benefits by reducing crashes, congestion, pollution and costs. They also benefit the immediate community with their functional and often aesthetically pleasing designs, as well as the resultant noise reduction. The Office of Safety has released a brochure entitled Roundabouts: A Safer Choice to “demystify” roundabouts for those who are still not convinced of their benefits. The publication’s target audience is the public, decision makers, legislators and others interested in learning about or promoting roundabouts. Education is vital to the acceptance and success of roundabouts. Navigating a roundabout is simple, yet drivers can be apprehensive about new and unfamiliar traffic scenarios. The brochure discusses key points to consider when driving through roundabouts. Over 17,000 copies of the brochure have been requested and distributed to date. For more information, or to request copies, please contact Ed Rice, FHWA Intersection Team Leader, at (202) 366-9064, or ed.rice@dot.gov. The Federal Highway Administration, Office of Safety Research & Development has issued its 2008 Public Release (Version 5.0.0) of the Interactive Highway Safety Design Model (IHSDM). The software and its associated documents are now available for free downloading at www.ihsdm.org. IHSDM is a suite of software analysis tools for evaluating safety and operational effects of geometric design decisions on two-lane rural highways. The previous 2007 version included five evaluation modules - Policy Review, Crash Prediction, Design Consistency, Intersection Review, and Traffic Analysis. This 2008 release adds a fully-functioning beta version of a Driver/Vehicle Module (DVM), as well as signifi cant enhancements to output/reporting capabilities, the evaluation process/wizard, the graphical user interface (GUI), data handling, the Highway Editor, accessibility features, help/documentation, and the Administration Tool. For details on what’s new in the release, go to http://www.ihsdm.org/wiki/Current_events. For free technical support of IHSDM, e-mail IHSDM.Support@fhwa.dot.gov or call (202) 493-3407. For more information, contact Shyuan-Ren (Clayton) Chen, FHWA Office Safety R&D at (202) 493-3054 or email clayton.chen@fhwa.dot.gov. In this course, you will learn the background of CRFs, including terminology, the components of a CRF, and how to identify and interpret appropriate CRFs. In addition, you will gain hands-on experience with safety diagnosis and the application of CRFs to compare the effectiveness of countermeasures. In this course, you will learn how to critically assess the quality of CRFs by understanding the measurement of safety as well as the statistical and methodological issues that affect the development of quality CRFs. Median Barriers – A Solution to Cross-Median Crashes. The FHWA Office of Safety Design has produced a DVD that contains two informational videos, the new Median Barriers – A Solution to Cross-Median Crashes, and the previously released video, Rumble Strips – A Sound Investment. The median barrier video reinforces the need for highway agencies to review their design standards to ensure they reflect the latest update of the AASHTO Roadside Design Guide (RDG). Chapter 6 of the 2006 RDG recommends that barriers be placed in all medians 50 feet wide or less. The video shows TV reports of median crashes and barrier construction projects to illustrate the importance of preventing deadly crossmedian crashes. It also describes the various barriers available for use in highway medians. Median Barriers – A Solution to Cross-Median Crashes will be available in February, 2009 and may be ordered from the FHWA Report Center by requesting publication # FHWA-SA-08-007. “Rumble Strips – A Sound Investment” is still available as a stand-alone DVD and may also be obtained free of charge from report.center@fhwa.dot.gov by requesting publication # FHWA-SA-07-024. The course focuses on the application of these countermeasures and design and safety operations best practices for substantive improvements to intersection safety. During the course, participants have the opportunity to present intersection safety situations that they are currently facing and discuss appropriate countermeasures and best practices to address those situations. For more information contact Thomas Elliott, NHI Training Program Manager at (703) 235-0319. FHWA’s newly released Pedestrian Safety Guide for Transit Agencies is intended to provide transit agency staff and roadway designers with an easy-to-use resource for improving pedestrian safety. The guide includes a variety of approaches to address common pedestrian safety issues that are likely to arise near transit stations, bus stops and other places where transit (bus or rail) is operated. It provides references to publications, guides and other tools to identify pedestrian safety problems. Descriptions of engineering, education and enforcement programs that have been effectively applied by transit agencies are included as well as background information about pedestrian safety and access to transit. You can view and download the document at http://safety.fhwa.dot.gov/ped_bike/ped_transit/ped_transguide/. Hard copies are available to order at http://safety.fhwa.dot.gov/ped_bike/ped_bike_order/. The 2007 fatality numbers in work zones have decreased to a 10-year low of 835. This also represents a 17% decline from 2006. We need to keep up the good work and keep these numbers decreasing. For more information on each State’s work zone status, visit the National Work Zone Safety Information Clearinghouse at http://www.workzonesafety.org. The FHWA Office of Safety has recently completed an updated “Toolbox of Countermeasures and Their Potential Effectiveness for Pedestrian Crashes.” This “toolbox” documents estimates of the crash reduction that might be expected if a specific countermeasure or group of countermeasures is implemented with respect to pedestrian crashes. The crash reduction estimates are presented as Crash Reduction Factors (CRFs). Traffic engineers and other transportation professionals can use the information contained in this toolbox when trying to figure out which countermeasures would be effective in improving safety at a certain type of locations (such as a signalized intersection). Some of the countermeasures featured include pedestrian countdown signals, providing sidewalks and paved shoulders, installing medians and raised islands, “road diets” (or roadway narrowing), adding intersection lighting, implementing a “leading” pedestrian interval, adding an exclusive pedestrian phase (scramble) to a signalized intersection, converting an unsignalized intersection to a roundabout, etc. 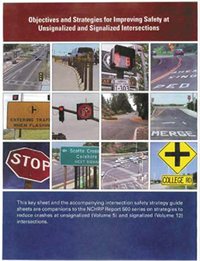 The Office of Safety has recently distributed a series of guide sheets and a brochure describing the 77 intersection safety countermeasures presented in NCHRP Report 500, Volumes 5, A Guide for Addressing Unsignalized Intersection Collisions, and Volume 12, A Guide for Reducing Collisions at Signalized Intersections. The guide sheet packet contains a single front and back sheet on each of the 77 countermeasures and a photograph or drawing of the treatment, along with information including keys to success, implementation issues and time frames, safety effectiveness, costs, and compatibility with other countermeasures. A key sheet is included with each packet of guide sheets. Also, a glove-box size brochure depicting the 77 countermeasures, along with tables on the applicability of each in addressing various crash types, has also been distributed separately. The purpose of these two items, which were accompanied by separate September 30, 2008, memoranda from David Nicol, FHWA Director of the Office of Safety Design, is to market and promote the knowledge and usage of these known intersection safety countermeasure treatments by providing simple, easy-to-read summaries and formats. The overall intent is that they will facilitate increased utilization of the treatments in addressing the nearly 9,000 fatalities and numerous crashes and injuries at intersections annually in the United States. We encourage wide distribution of this material to State and local transportation agencies, and anyone else responsible for intersection safety. For copies and information about this intersection outreach material, contact Ed Rice, FHWA Office of Safety Intersection Team Leader, at ed.rice@dot.gov. The safety of intersections, interchanges, and other traffic facilities is most often assessed by tracking and analyzing police-reported motor vehicle crashes over time. Given the infrequent and random nature of crashes, this process is slow to reveal the need for remediation of either the roadway design or the flow-control strategy. This process is also not applicable to the assessment of the safety of roadway designs that have yet to be built, or flow-control strategies that have yet to be applied in the field. 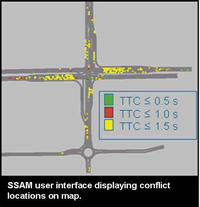 SSAM is a combination of micro-simulation and automated conflict analysis which analyzes the frequency and character of narrowly averted vehicle-to-vehicle collisions in traffic, to assess the safety of traffic facilities without waiting for a statistically above-normal number of crashes and injuries to actually occur. SSAM documentation is available in two FHWA reports: Surrogate Safety Assessment Model and Validation: Final Report, FHWA-HRT-08-051 and Surrogate Safety Assessment Model (SSAM): Software User Manual, FHWA-HRT-08-050. (https://www.fhwa.dot.gov/research/topics/safety/intersections/). For more information contact Joe Bared at joe.bared@dot.gov, or (202) 493-3314. 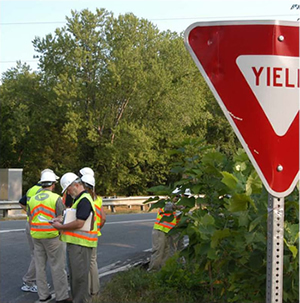 The Office of Safety is pleased to announce the availability of new training materials on the topic of maintaining traffic sign retroreflectivity. The CD contains two training courses and an appendix of additional resources. The first training course presents “The Basics of Maintaining Traffic Sign Retroreflectivity.” The second course presents “Inspector Training for Sign Retroreflectivity.” The two training courses include complete speaker notes and detailed instructions on presenting the classroom demonstrations. The demonstrations require the use of some additional props. These include mini signs with retroreflective sheeting, a regular flashlight, and several mini flashlights. A possible source for the mini flashlights is included on the CD. For more information contact Greg Schertz at (720) 963-3764 or email greg.schertz@dot.gov or Matt Lupes at (202) 366-6994 or email matt.lupes@dot.gov. For additional information on traffic sign retroreflectivity, visit our web site: https://www.fhwa.dot.gov/retro. Each year, across all 50 States, there are nearly 5000 deaths that result from unsafe driving behavior involving large trucks and cars. A Ticketing Aggressive Cars and Trucks (TACT) Program can help reduce aggressive driving that causes crashes between large trucks and passenger vehicles in your State. TACT is based on the Washington State TACT pilot that confirmed that intense, selective traffic enforcement that is well publicized can positively impact a driver’s knowledge, attitudes, and behaviors while driving around large trucks. 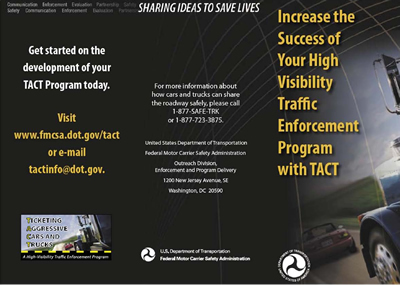 States that have implemented TACT programs, including Washington, Georgia, Kentucky, North Carolina, and Pennsylvania, have formed a TACT State Peer Exchange Network (T-SPEN) to share lessons learned, resources, and approaches in saving lives by reducing crashes between passenger and commercial motor vehicles (CMVs). To implement a TACT program, you can use basic grant funding from the Motor Carrier Safety Assistance Program (MCSAP). You can also apply for incentive and high-priority grants which support TACT Programs or go to http://www.grants.gov to seek other funding sources and grants opportunities. SAFETEA-LU requires States to conduct comprehensive and high visibility traffic enforcement and CMV safety inspection programs in high-risk locations and corridors. The National Work Zone Safety Information Clearinghouse is a joint effort between FHWA, the Texas Transportation Institute, and ARTBA. The primary purpose of the Clearinghouse is to promote safety for workers, motorists, and facility owners and operators in roadway construction work zones. It is perhaps the largest online repository of work zone information. It contains on-line databases, work zone crash and fatality statistics, training programs, research services, webinars, video vault, and current events related to work zone safety. On August 19, 2008, the International Road Federation (IRF) announced the winners of its 2008 “Global Road Achievement Award” (GRAA) Competition. According to IRF, the competition was founded in 2000 to recognize the exemplary projects and organizations that place the roadway development industry at the forefront of social and economic development. An independent panel of judges from around the world with expertise in the roadway development industry selected the winners for this year’s competition. The Clearinghouse was selected for top honors in the category of “Advocacy & Lobbying” for its efforts to promote and advocate roadway work zone safety across the United States and around the world. The Clearinghouse also distributes promotional materials upon request and at trade shows and other special events such as the National Work Zone Safety Awareness Week. Examples of these materials are Wrist Bands with Web Address, “Know the Signs” Posters, Clearinghouse Brochures, ARTBA Safety Program Brochures, and Work Zone Conference Flyers. For more information contact Morris Oliver in the Office of Safety Integration at (202) 366-2251 or morris.oliver@dot.gov.